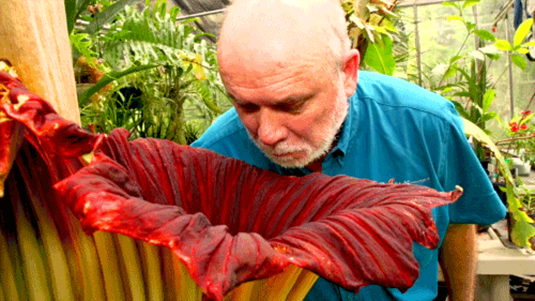 Edward Smelling the newly bloomed Corpse Flower. I remember, roughly fifteen years ago, I was staying in an apartment hotel in the Chinatown district, of Toronto, when the stink, emanating from down the hall, almost overcame me. Venturing, nervously, towards the source of the odour, I found myself in the presence of an oddly shaped spiky vegetable-like thingy that I now know to be a durian. It’s a fruit widely used in south Asia, which is notorious for its smell. The durian fruit has a distinct odour. A resident, of the hotel, had left the fruit in the hallway, allowing others to share the fumes. Presumably, he or she did this because the durian was too strong smelling to be inside the apartment. Perhaps, I thought, he had stumbled onto an object that marketable as an organic burglar repellent. I am interested, in principle, in encountering the durian again. Over the intervening years, I have gradually lost my sense of smell. The condition of diminished capacity to smell is anosmia, which affects about two million Americans or about one-in-150. Going face to face with a durian would be an excellent test to determine whether I retain any residual capacity to smell or whether I have truly lost it. Now, I learn I can try for an alternative, the corpse flower. According to the Bloedel Conservatory, in Vancouver, this is largest plant in the world and has recently bloomed. On blooming, it released an aroma compared, by those that know, to the smell of used diapers or hot garbage. Replication is the route to confirmation. It might be worth the airfare to Vancouver just to check my reaction to the copse flower on top of the durian. My goal would be akin to noted scientists that replicate an experiment many times before claiming confirmation of the results. Much the way athletes must submit a double urine sample before they can participate in the Olympics. Funny enough, my sense of smell has diminished, but my sense of taste is unaffected. Once I put something in my mouth, the buds seem to slip into overdrive and I experience the full sensation for which my smell sense would have been priming me. I would like to say that my other sensations of touch, sight and hearing are enhanced by way of some sort of neuro-plastic compensation, but it’s not so. Obviously, I miss the pleasures of an active sense of smell. I liked to smell a fresh flower, a distinct perfume or an apple pie in the oven. I would certainly not be the first person to turn to when there is a need for someone to be the canary in the coalmine to detect a gas leak. Just think of all the opportunities my anosmia will give me to enjoy life while others can’t. When there is a strong wind blowing from the east, for example, and the air is pregnant with eau de mushroom plant, I can be sitting in my yard enjoying a tall cold one, while others cower inside praying for a wind shift. To complete the picture, I’ll be enjoying it with a generous serving of limburger cheese.